Charging cables get a lot of use. Charging cables get a lot of use. Constant plugging and unplugging can quickly rub away cable sleeves and fray connector wires. 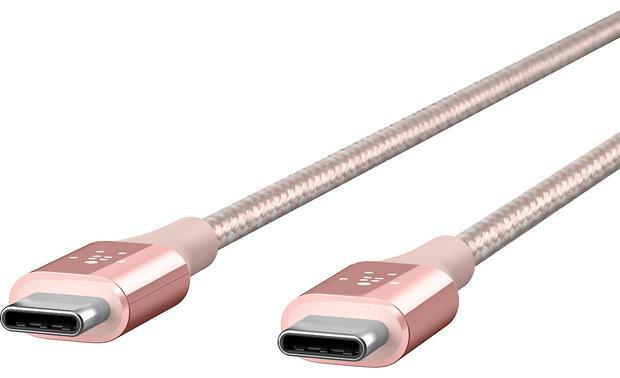 Belkin built their Mixit DuraTek USB-C-to-USB-C cables to stand up to the strain. Tough Kevlar® fibers reinforce the wiring for added strength, while durable thermoplastic rubber encases the connectors, designed to withstand over 5,000 180° bends. But Belkin didn't stop there. A double-braided nylon jacket protects the cables and provides flexibility and abrasion resistance. Flexible insulation surrounds the conductors, so they can bend easily without damage. The connectors feature polished extruded aluminum casings, while the printed circuits inside are nestled in protective metal sleeves. 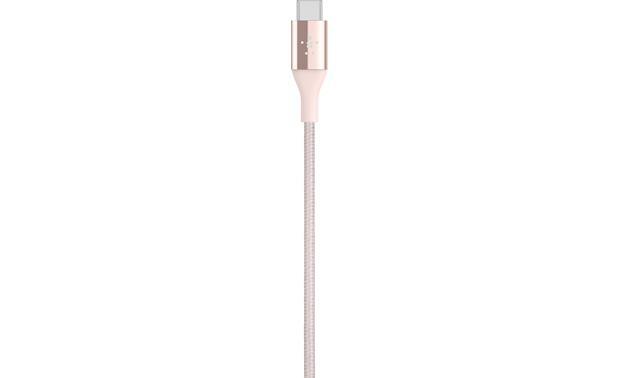 The cable supports 3-amp charging, so your connected device recharges quickly and safely. DuraTek USB-C to USB-C Cable: The Belkin DuraTek USB-C to USB-C USB cable is constructed from superior quality materials for ultimate durability. Kevlar fibers reinforce the inner wiring for added strength, abrasion-resistant nylon forms a tough outer jacket, and highly flexible insulation minimizes damage from friction. The strength created by these resilient ingredients is further enhanced by smart design details to reinforce the cable at its stress points. This ensures the cable can withstand even the most demanding routines, and perform above and beyond expectation to deliver a cable that is extremely durable. 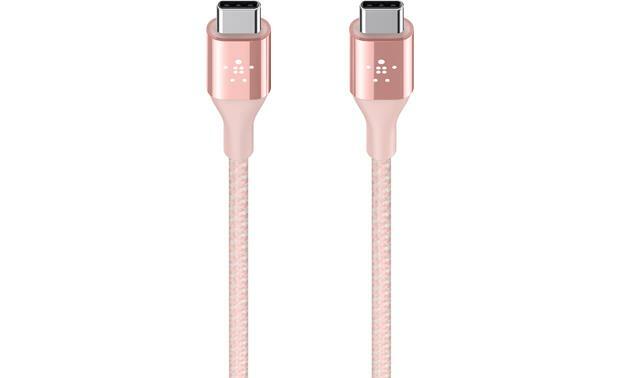 Compatibility: The Belkin DuraTek USB-C to USB-C USB cable is compatible with a variety of electronic devices that feature a USB-C port; including select Samsung, LG, HTC, Google, and Huawei smartphones and tablets. Dupont Kevlar: One of the key ingredients of DuraTek's secret strength is Kevlar. This resistant aramid fiber is used the world over for everything from bullet resistant vests and crash helmets to surfboards and extreme sports gear. 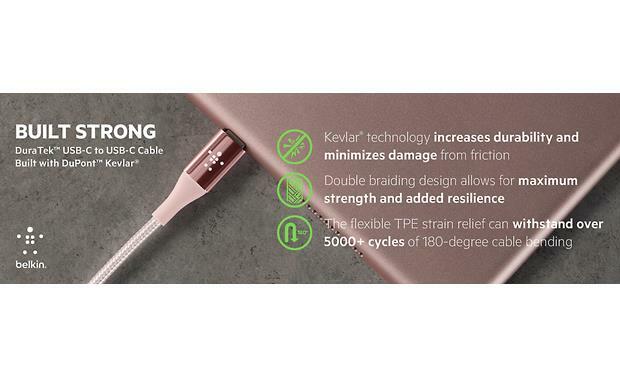 Strong Kevlar strands are built into the cable adding ultimate strength. Able to flex without stretching, these fibers provide structure to keep the wires inside from damage. Double Braided Nylon: The external cable braiding is made from a premium and hard-wearing nylon material. Double braiding is a technique used in rope making and gives maximum strength and added resilience. This makes the cable abrasion resistant, more flexible, lightweight and less prone to fraying. Flexible Insulation: Inside the cable, many wires co-exist to provide better functionality and conductivity. Insulation protects the wires from damage as the cable bends and flexes, but some can cause stiffness, affecting the overall suppleness of the cable. The highly flexible insulation within DuraTek minimizes friction, allowing the cable to bend easily and the wires within to move without damage. Better Strain Relief: The 18mm strain relief where the cable joins the connector head has been optimized to withstand the greatest amount of bend cycles. Made from flexible TPE, this added length and flexibility helps to absorb stress and reinforce the juncture between the cable and the connector head to prevent separation. Proven in testing to withstand 5000+ cycles where the cable is bent to 180-degrees, this cable is highly resistant to splitting and breakage. Not just flexible, TPE is also smooth, tactile and more environmentally-friendly than the standard PVC. Longest MIX-IT^ UBS-C TO USB-A. 10 -12 ft.? Searches related to the Belkin MixIt USB-C™ Cable Duratek™ USB-C to USB-C cable.